Pull up a hammock and order a matcha at the sunny daytime iteration of nighttime bar Loosie Rouge. (Yes, that’s right, there are hammocks. And plants. Many, many plants.) Morning coffee and spirulina doughnuts turn into kale-matcha margaritas and dollar oysters when happy hour starts … at noon. An old stevedore haunt of yore, the appeal of the mid-century institution is its decided aversion to trends. The original neon signage, red leather barstools, and classic cocktails help the bar retain an easy authenticity that’s hard to come by. Owned by LCD Sound System frontman James Murphy, the hype surrounding the unpretentious wine bar isn't dying anytime soon. Reasonably priced natural wines, table wines, and unusual varietals comprise the wine list, while cedar and burlap comprise the minimalist decor. The two DJs behind Mister Saturday Night have opened a big factory space and backyard on the Ridgewood/Bushwick border. In warm weather, there’s ample room to spread out (full of New York’s hottest commodity — grass), trees, hills, a a ping pong table, and string lights along the perimeter at night. Play games, eat dinner, have drinks, watch a movie. And check out Mister Sunday, the duo’s epic daytime dance party every Sunday during the summer. The sibling to nearby Prospect Heights Mexican hotspot El Atoradero has nearly 50 mezcals to choose from at all price points. Sip slowly and admire the Mexican talavera tiles that line the counter opposite the bar — the owner brought them back from Puebla herself. Old-school Japanese cocktail culture is alive and well at the 1920s-style izakaya speakeasy where the drinks are more "ceremonial" than "handcrafted." To get there: Pass through bustling, light-filled Walter’s to the quieter, darker, swankier back room hideaway. A small, remote, vaguely tropical-themed Bushwick dive bar is the center of action for the Brooklyn dance scene. The dance floor is small. The kids can get sloppy. But the DJ lineup is typically excellent and the energy is palpable. The crowd goes wild. You know it's summer when Habana Outpost opens up its chain link gate, fires-up the food truck grills, and flicks on the bike-powered smoothie machine. The seasonal hangout serves cheap beer and Cuban sandwiches in its open lot; has a DJ, film nights, and crafts for kids; and welcomes a fun, laid-back crowd that spills out onto the streets and nearly turns every day into a block party. An unassuming neighborhood bar is the starting line for an awesome night. Great people watching, kitschy drinks (amaretto float! ), and a killer bar menu (it's all about the fried chicken with itsy biscuits and honey butter). Service can be a bit all over the map, but the festive music and vibe more than makes up for it. The more mollusks the merrier is the unofficial motto of the super popular Williamsburg oyster bar. Inspired by the parlors of Paris and the saloons of the Big Easy, it’s a darling jewel box crammed with Belle Epoque references, glistening bivalves, and delta blues sounds. Red Hook's clubhouse is a dive bar well-worth the transit trouble you'll encounter getting there (it's a 1-3 mile walk from the nearest train stations). Being that it's an old mariner's hang, it's weathered, cozy, salty, and filled with live bluegrass in the back. Excellent for catching up and/or canoodling any time of year. A dark, cheap, bare bones, 19th-century tavern for serious drinkers. You may have to push a few bros out of the way to get to your pint of Old Speckled Hen, but it'll also give you a good look at the gorgeous wooden bar. We hear it's currently getting a facelift, but should be open again come May. The Bowery Presents, a concert promoting/booking business in NYC, pretty much has its finger on the pulse of every must-see indie band, which they'll book at one of their many venues (Mercury Bar, Bowery Ballroom, Brooklyn Steel), including this one in the heart of WIlliamsburg. American Nouveau in Prospect Heights, Brooklyn. Sit at the slender bar with piano key stools to watch mixology in action. Take your precious cocktail to the back patio for mingling. 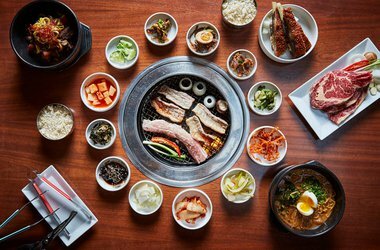 The bustling Korean barbecue joint brings rarely seen regional specialties (like blood sausage and seafood corndogs), tiki drinks and locally made soju, and themed karaoke rooms to a wood-clad warehouse with communal and bar seating a block from the Gowanus Canal.